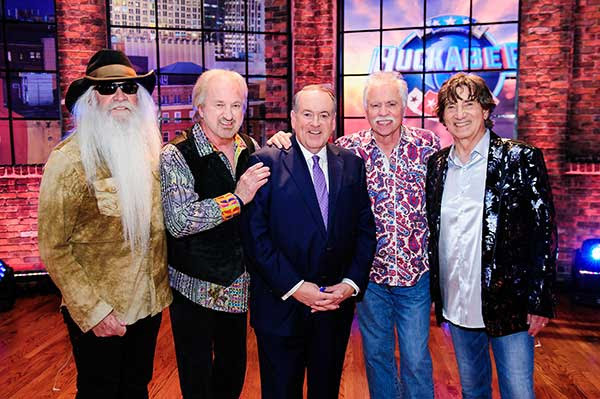 THE OAK RIDGE BOYS TO PERFORM ON ‘HUCKABEE’ THIS WEEKEND ON TBN | 2911 Enterprises, Inc.
Made up of members Duane Allen, Joe Bonsall, William Lee Golden and Richard Sterban, The Oak Ridge Boys are members of the Grand Ole Opry and achieved, arguably, country music’s highest honor when they were inducted into The Country Music Hall Of Fame in October 2015. The group has given many command performances throughout their legendary career, from performing for King Gustaf of Sweden, to Her Royal Highness Princess Caroline of Monaco, to Her Royal Highness Princess Anne of Great Britain and five U.S. presidents: Jimmy Carter, Ronald Reagan, George H.W. Bush, Bill Clinton and George W. Bush. In 1976, they performed in Russia during the “Iron Curtain” days on a three week tour with Roy Clark – a first for ANY country music artist. Since the start of their highly decorated career, the Oaks have achieved five GRAMMY® Awards, and multiple CMA, ACM and Dove Awards for their crossover brand of pop, country and gospel music that spans multiple generations. In preparation for the release of their highly anticipated new album 17th Avenue Revival (March 16, Lightning Rod Records), The Oak Ridge Boys are gearing up for media rounds in Nashville and New York City where the quartet will make appearances on The Big Interview with Dan Rather, Larry’s Country Diner, The Grand Ole Opry, a sit-down one hour special on RFD, The 700 Club, SiriusXM, Jesus Calling, Southern Living, Fox News Radio, METRO Focus, Westwood One, Celeb Secrets, Heartland, Nashville Insider, Country Rebel and more. In front of an at-capacity, standing-room-only crowd at the Country Music Hall of Fame™ and Museum CMA Theater on Monday (3/5) night, The Oak Ridge Boys electrified with hit after hit, and then introduced their the new album. In addition, and in typical Oak Ridge Boys fashion, the group set a unique precedent by presenting the Country Music Hall of Fame with a special Edison cylinder recording of “Brand New Star,” the first track from their new album. “It’s exciting to me that our manager, Jim Halsey, and Logan Rogers, President of Lightning Rod Records, were able to envision the idea of releasing the new album, all or in part, on virtually every format of commercial recording technology since the Edison cylinder — and to find people to record ‘Brand New Star’ on cylinder,” said Duane Allen. The Oak Ridge Boys, who have sold over 41 million units worldwide, are synonymous with “America, apple pie, baseball, pop, rock, gospel and country music.” In addition to their awards and accolades in the country and pop music fields, they have garnered five GRAMMY® Awards and nine GMA DOVE Awards as well as the Mainstream Artist of the Year Award at the ICM Awards. The group—Joe Bonsall, Duane Allen, William Lee Golden, and Richard Sterban—have earned prestigious membership in the Country Music Hall of Fame (2015 Inductees) and Grand Ole Opry, and are known worldwide as one of recording history’s most extraordinary musical successes. They have charted single after single and album after album, celebrating two double-platinum albums and more than 30 Top 10 hits, including No. 1 chart-toppers “Elvira,” “Bobbie Sue,” “Thank God For Kids,” “American Made,” “Y’All Come Back Saloon,” among dozens more. For more information and to view upcoming tour dates for The Oak Ridge Boys, please visit oakridgeboys.com.